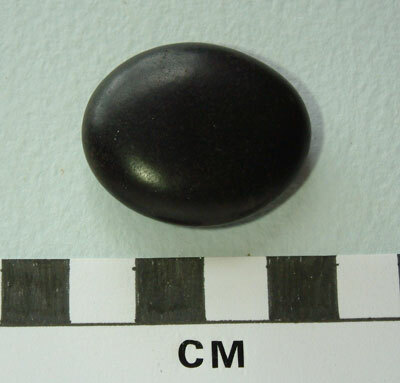 A fine burnisher/whetstone recovered from the main midden deposit manufactured from a fine-grained stone (above); and a stone counter or gaming piece made on a dark natural pebble. The latter has taken on a glossy polish, possibly through handling. 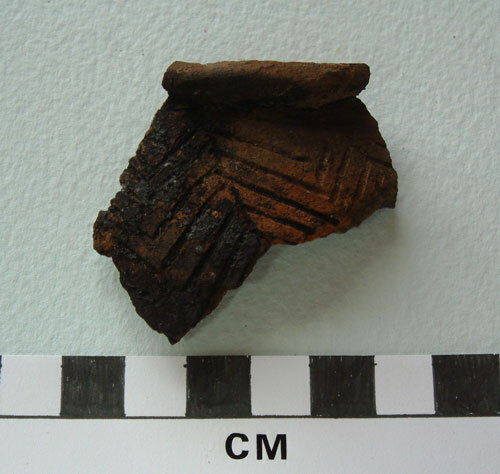 We have recovered a varied assemblage of pottery fragments from the excavations this year including diagnostic rim and base sherds, including the decorated piece shown below. Many of the bronze items we have recovered from the site have deteriorated due to the effect of sea spray causing corrosion. 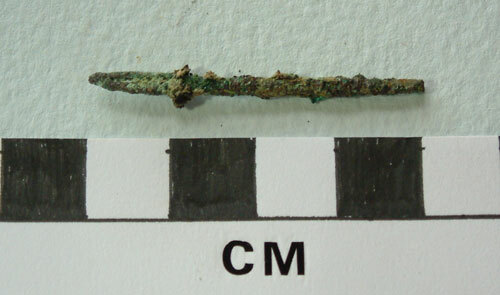 However, we have found some items that are in a better condition and can be recognised before conservation work takes place, such as this needle fragment shown below. 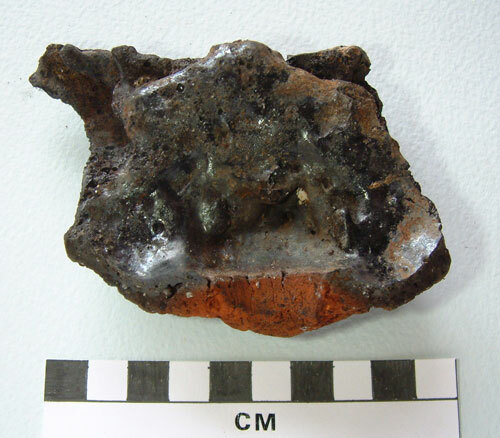 We have recovered quite a few finds associated with metalworking at the site, especially slag, fragments of clay furnace lining, hammer scale and sphericules, and ceramic crucible fragments. These materials so far indicate potential smithing in iron and smelting and smithing in bronze, although we have yet to recover an in-situ furnace. 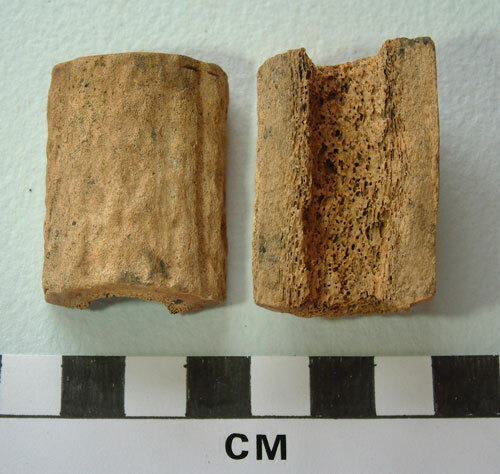 However, the images below show a fragment of vitrified clay furnace base, recovered from the main midden deposits, which includes a part of the hole where the bellow pipes entered the furnace wall and introduced air into the process. Many of the finds we have recovered from the site are manufactured from bone, antler and horn, while worked anlter fragments indicate that manufacturing in these materials most likely took place at the site. 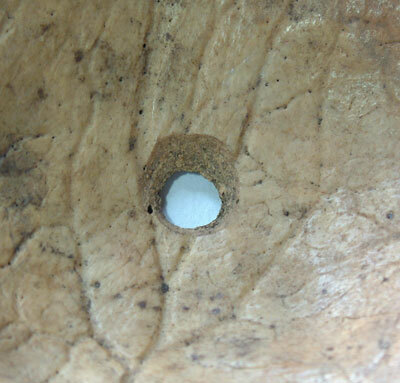 Finds in bone include this plain, but stubby pin (above), while a common find at the site includes segments of antler beam that have also been bored through the centre (below). The latter where found in quite high concentrations in one area of the site and we cannot be sure at the moment if they have broken during manufacture or while in use - whatever this may have been. 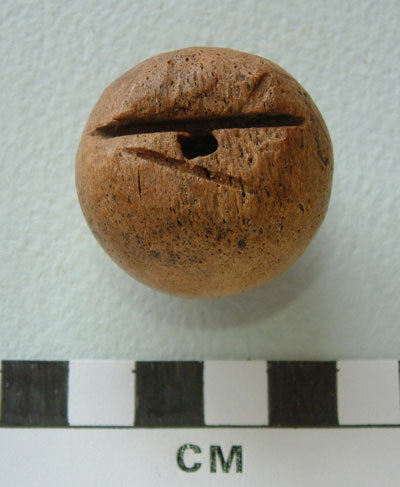 They are a fairly common type of find on Atlantic Iron Age sites in Scotland. 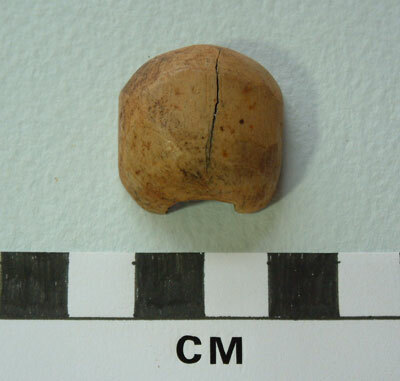 The two images below show half of a possible bone pin head, the other half of which we may have recovered during excavations in 2008 at the site. 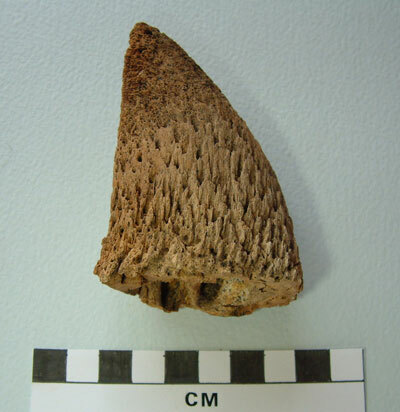 We have also recovered a few nice bone points and needles, along with this antler tine point (see image below). 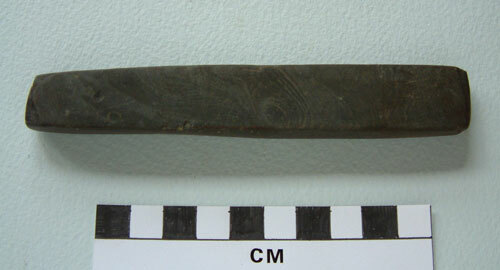 The tine has been cut off from the main antler beam and has then been paired down using a knife, after which the point has received some polish - either during manufacture or through use. 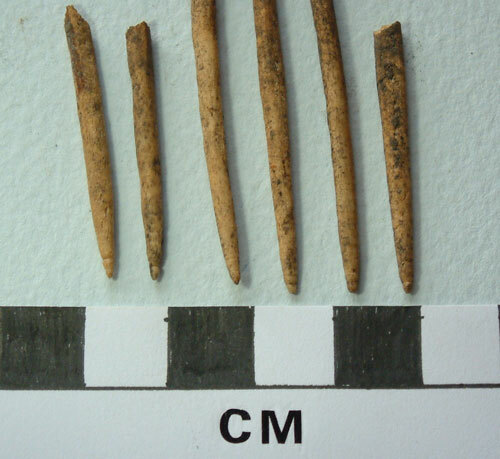 In the last news update for the site (see main News Page for details), I mentioned that we had found a cache of 24 slender antler points that had been deposited adjacent to one of the slab-built hearth settings. The two images below show several of the finer points. 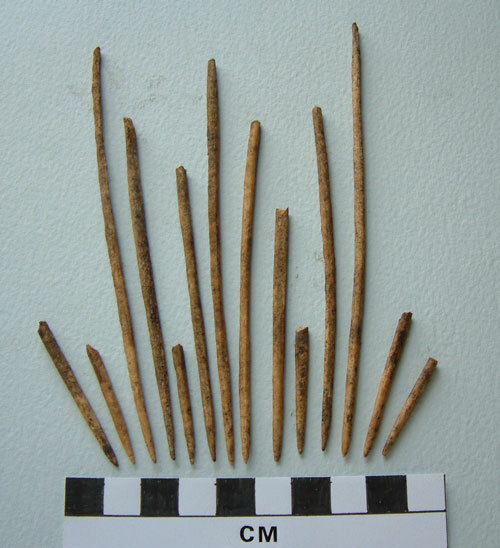 A closer view of the ‘working ends’ of a few of the points shows slight polish and circumfrential wear patterning, which results from the use of the implements. Could the finds be associated with thread working? During our excavations at the Fiskavaig site in 2008 we recovered possible pieces of whale bone, while at the High Pasture Cave site we have previously found a fine ivory sword or dagger pommel - possibly manufactured from Walrus tusk. The fine sword or dagger pommel shown in the three images below was recently found at the Fiskavaig site, adding to a small assemblage of ivory artefacts recovered from Iron Age sites in Scotland. 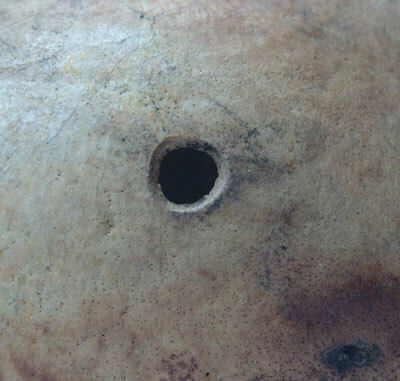 The base of the pommel is flat and a rectilinear hole has been gouged into this surface in the centre of the object. 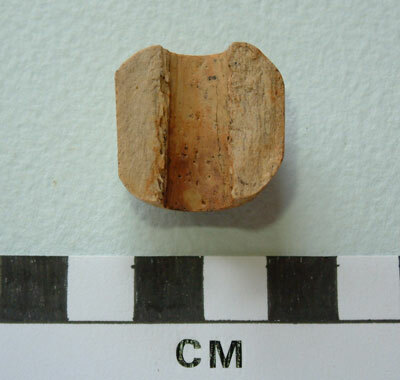 The image also shows two grooves that have been cut into this surface, possibly to stop the object rotating during use. 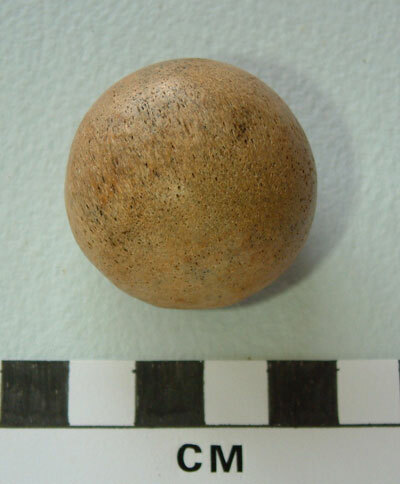 A close inspection of the surface of the sphere shows fine working marks that have mostly been removed through polishing to leave a well-worked surface. 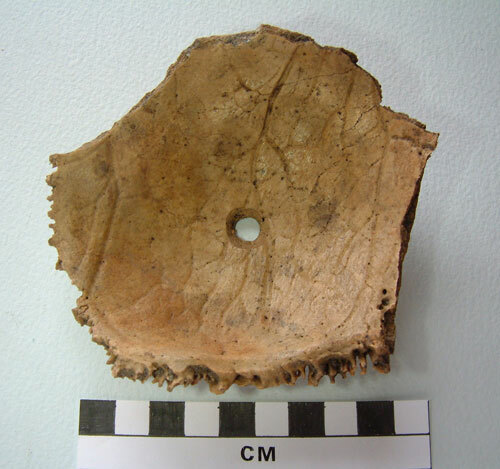 The image below shows a portion of a horn core that has been worked - the horn has been cut through. 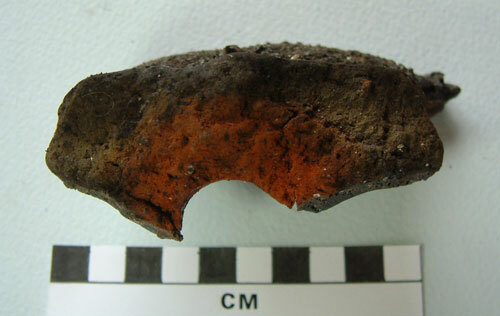 This suggests that horn may also have been used to manufacture implements at the site. 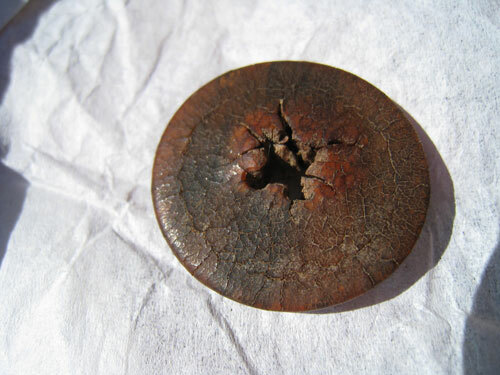 A very unusual and potentially rare find made at the site is this circular button (see images below). 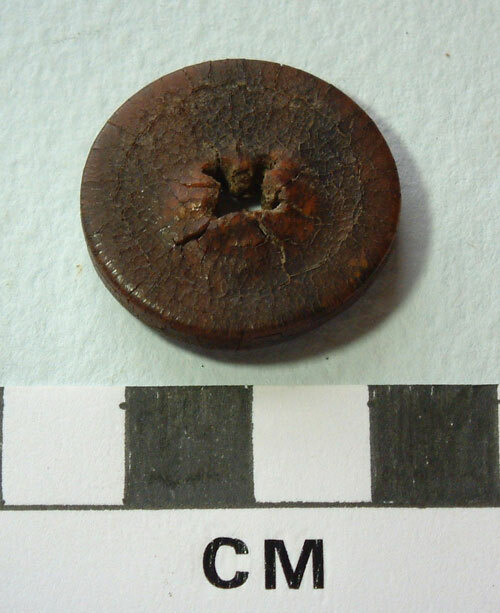 Possibly manufactured from the outer sheath that covers the horn core, the button displays three or possibly four central attachment holes, very similar to bottons of today, that have broken through. The image below, taken by Sue Watkins - one of our regular volunteers on site - shows the colour and patination of the object. 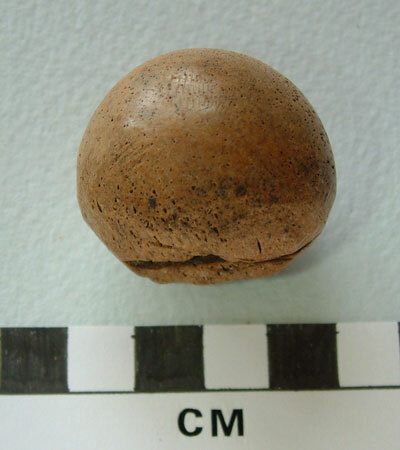 In the last update of the news page on this website for the Fiskavaig site, I mentioned the discovery of the fragment of skull cap that has been drilled to form a possible suspension point. Ian Armit at the University of Bradford, and one of his PhD students Fiona Tucker, have been studying human remains in Iron Age contexts, particularly from Scotland. 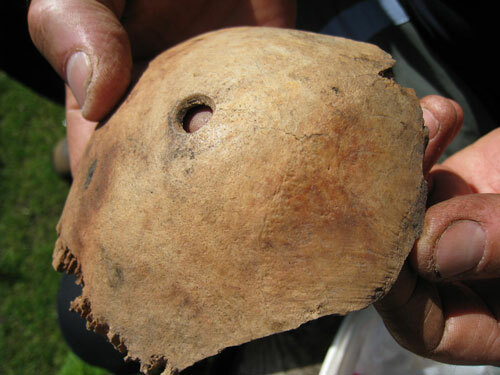 Part of this work involves a major re-dating programme funded by Historic Scotland, which will produce AMS dates for the drilled skull fragments from Cnip in Lewis, Hillhead Broch in Caithness and a third from Lower Dounreay in Caithness. One major reason for radiocarbon dating these objects is to see if they are older than the contexts in which they were found. Could they have been some ‘revered’ part of an ancestor that was displayed in settlements, or other types of site? Fiona and Ian will be taking a close look at the cranial fragment recovered from the Fiskavaig site in November, while we also hope that a date can be taken on the fragment. 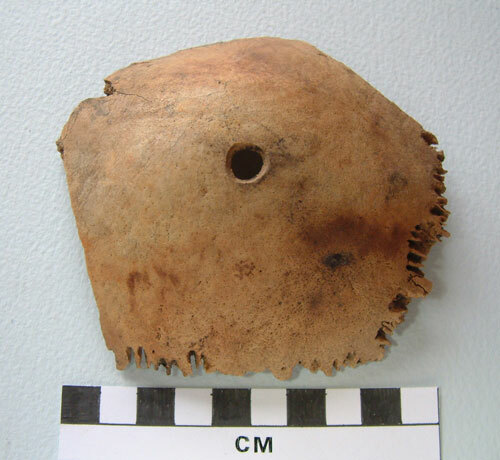 The images below show the perforation through the skull fragment, which have been drilled/bored from both sides, indicating that this must have occurred after death.